For a harrowing couple of days, it wasn't clear whether former Blink-182 drummer Travis Barker and celebrity disc jocket DJ AM would be around to ring in 2009. The good news is, not only are they alive and well, but they're going to perform together for the first time since surviving a fiery plane crash in September. According to the Associated Press, Barker and DJ AM, whose real name is Adam Goldstein, will be the headliners at New Year's Nation's Los Angeles New Year's Eve Party at The Lot in West Hollywood, California. 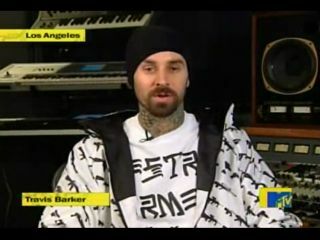 "I'm ready to get back on stage with AM and continue to rock the house," Travis Barker said in a statement. "I'm very excited to bring in the New Year in my hometown of LA." Revelers can stream the performance on the Internet, which will be broadcast at other New Year's Nation parties across the US. It will mark the first concert for the pair - who go by the name TRVSDJAM - since they performed at a free concert for about 10,000 people in Columbia, South Carolina, before boarding a Learjet 19 September for Los Angeles that crashed and killed four people.